1. Install Surge Protectors: Installing individual surge protectors or a whole home surge protector system can add a valuable layer of protection. When lightning strikes it can damage your sensitive electronics, appliances, computers and more if they are not protected from electrical surges. 2. Keep Your Roof Maintained: Roofs can be very vulnerable during storms with high winds and rain. 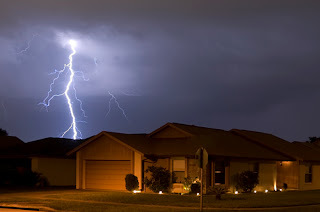 Keeping your roof well maintained and strong can help it “weather” the storm. 3. Check Your Garage Doors: Garage doors can take the brunt of much of the strong wind and rain that accompany thunderstorms. You need to make sure they are in good condition and fully sealed to help prevent storm damage. Make sure any dents or damage are immediately fixed. Keep your family and property safe during the storm. Regular maintenance and acting proactively can make a such a difference when thunderstorms hit your area. Let us know if you need help protecting your home from storm damage or if you need emergency storm damage restoration.